Deutsch: Lage des Landes Niedersachsen in Deutschland. English: Location of Lower Saxony in Germany in Germany. This vector image includes elements that have been taken or adapted from this: Germany2 location map.svg (by NordNordWest). 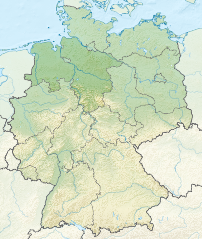 This vector image includes elements that have been taken or adapted from this: Relief Map of Germany.png (by Виктор В). This large map was created with Adobe Illustrator. This large SVG-map was uploaded with Commonist. This page was last edited on 25 February 2017, at 07:06.